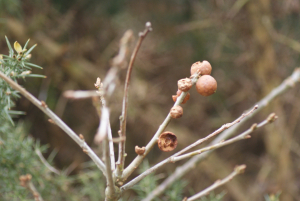 Observation - Marble Gall Predation - UK and Ireland. Description: Marble gall on oak sapling eaten and grubs of A. kollari and any inquilines and/or parasitoids removed. Marble gall on oak sapling eaten and grubs of A. kollari and any inquilines and/or parasitoids removed.